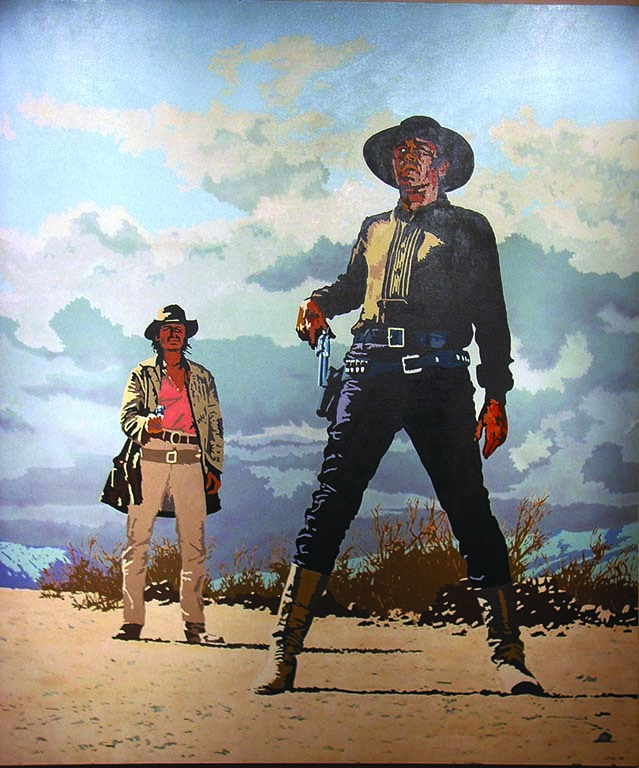 The Tucson Museum of Art’s Western Heroes of Pulp Fiction ranges from to R.G. 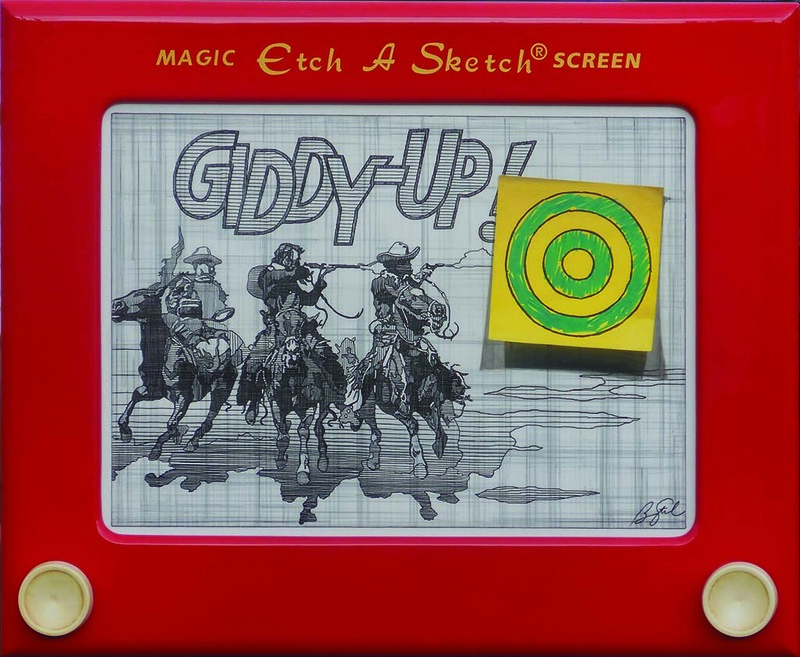 Harris’ Sheriff, 1934, for Thrilling Western Magazine to the more contemporary Giddy-Up!, 2015, by Ben Steele, and Wyoming #44, 1973, by Bill Schenck. Click here to view more photos from the story. The American West has always been anchored in myth. When Thomas Jefferson sent Meriwether Lewis and William Clark on their famous expedition, past the Mississippi River and deep into the Louisiana Purchase, the third president hoped the men would send back tales of mastodons roaming the plains. The misperceptions and legends have persisted ever since, and they set the backdrop for a new exhibit at the Tucson Museum of Art. 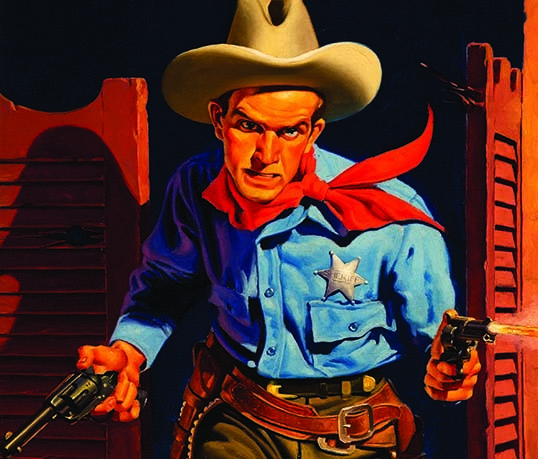 Western Heroes of Pulp Fiction: Dime Novels to Pop Culture spans more than a century of artwork that tracks how the American psyche has been captivated by the iconic — if not stereotypical — characters of the West. The cowboy with the square-cut jaw. The damsel in distress. The Mexican bandit. You can conjure these images so easily in large part because dime novels, pulp magazines and comic books captured the genre long before you were even born. That changed with Owen Wister’s The Virginian. In 1902, the first true Western ever written recast the cowboy into the heroic, chiseled character we know today. Around the same time, Brindza says the dime novel starting fading away, comic books began to take their place, and the transformation of the hero continued. The artists who worked in these mediums almost always captured their heroes in action — perhaps a sales pitch to potential readers at a crowded newsstand. The danger on these covers often feels imminent but unseen, lurking just outside the confines of the page. Brindza’s favorite piece is a 1934 R.G. 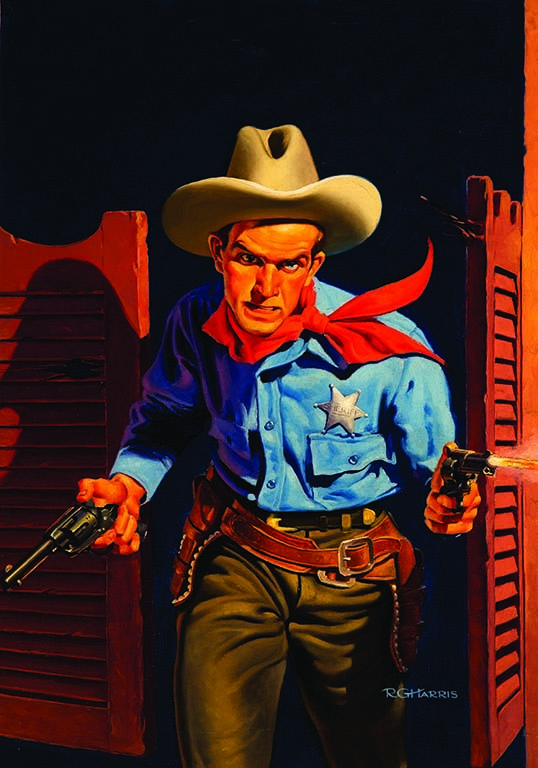 Harris cover for Thrilling Western Magazine. Harris paints a young, scowling sheriff, red kerchief tied around his neck, breaking through the swinging doors of a saloon, guns blazing. To Brindza, the image perfectly captures the masculine mystique of the American West. It’s also an image that’s become outdated at a time when racial and gender biases are breaking down. Which is to say that modern artists are finally catching up with the often-ignored truth that Westerns have always known: Our heroes are just people. See Western Heroes of Pulp Fiction Oct. 24–Feb. 14 at the Tucson Museum of Art. For details, visit tucsonmuseumofart.org.